The 1969 South African Grand Prix, formally the Third AA Grand Prix of South Africa (Afrikaans: Derde AA Suid-Afrikaanse Grand Prix), was a Formula One motor race held at Kyalami Circuit on 1 March 1969. It was race 1 of 11 in both the 1969 World Championship of Drivers and the 1969 International Cup for Formula One Manufacturers. The 80-lap race was won by Matra driver Jackie Stewart after he started from fourth position. Graham Hill finished second for the Lotus team and McLaren driver Denny Hulme came in third. In the weeks leading up to the first Formula One race of the 1969 season, entries were being announced for the race, with all the teams, apart from Ferrari expected to nominate two drivers for the race. Enzo Ferrari, the managing director of the team he founded, announced that Ferrari were only going to nominate one driver for the race. To most people's surprise, Ferrari at first nominated two drivers for the race without explanation. However, the decision was later changed, with only Chris Amon nominated eventually for Ferrari. Brabham, BRM, Lotus, Matra and McLaren all chose to nominate two drivers for the race meeting. Surtees's qualifying time was excluded as he had started at the back of the grid. ^ "Motor Racing Programme Covers: 1969". The Programme Covers Project. Retrieved 7 July 2017. ^ Hilton, Christopher (November 2006). Michael Schumacher: The Whole Story. Haynes Publishing. p. 15. ISBN 1-84425-008-3. 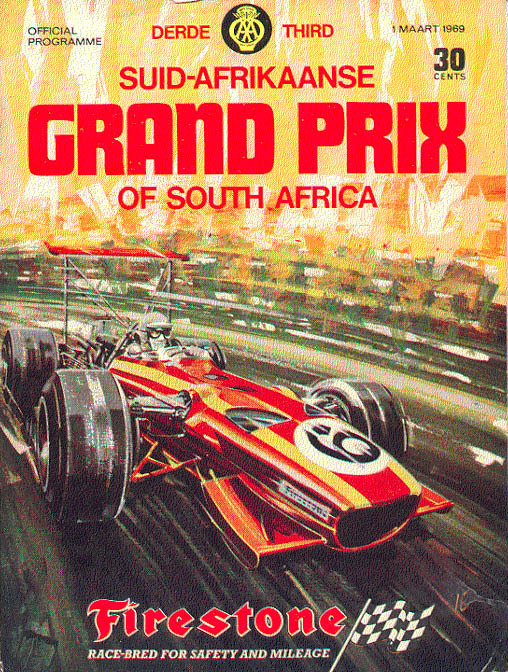 ^ "1969 South African Grand Prix". formula1.com. Archived from the original on 9 January 2015. Retrieved 22 December 2015. ^ a b "South Africa 1969 - Championship • STATS F1". www.statsf1.com. Retrieved 20 March 2019. This page was last edited on 20 March 2019, at 16:54 (UTC).